Jim Orban shared great news on cardiac surgery which has come a long way since the first heart transplant in Ottawa in 1984 and the recipient lived until he was 65 in 2007. The Ottawa Hospital has made a lot of advancements in cardiac care since 1976 and is the largest cardiac referral centre for 20 local hospitals and across Canada. With 1,400 very skilled staff to manage the 220,000 patients visited last year they completed 2,000 complex bypass surgeries and 30 transplants. They continue to build for excellence with over 500,000 square feet and current construction will have the Heart Institute in one building. The next frontier sees minimally invasive heart surgery and robotics, totally implantable artificial hearts, virtual interactions and more. Special thanks were given to James Maxwell for suggesting we hold a golf tournament at Tecumseh Golf Course and his friend and sponsor Alan Smith was challenged to bring it together. Kiwanians went to work in September and met the challenge with 110 golfers and additional dinner attendees. We also recognized La-Z-Boy Home Furnishings and Décor, and Groupe Fortin of Tecumseh Golf Course, who were the presenting sponsors of the event. Bottom line was a revenue-make of $25,000. Thank you James Maxwell, David Maxwell, and Pierre Fortin! We welcomed Matt Burns, Account Executive with new Corporate Member David Burns & Associates, who was sponsored by Alan Smith. Matt joins us along with his brother Ian Burns who was previously introduced to the club by Alan. Welcome to the Club, Matt! Alan Smith received the rose for his support of our club projects during his 40-year tenure with our club and for continuing to think about Kiwanis and ways for us to raise funds. He has sponsored 7 new members in the past 2 years as he is proud to share Kiwanis with his friends and business associates. Congratulations Alan. The author of many books and multiple articles on Canadian military nursing and on the impact of the war on the Canadian home front, she has curated three major exhibitions since joining the Canadian War Museum in 2012. We will be joined by our sponsored 211 Ottawa Kiwanis Air Cadets Squadron. Invite a Veteran or a Canadian Armed Forces member or anyone who contributed to the war effort. Heidi Sveistrup, Interim CEO and Chief Scientific Officer of the Bruyère Research Institute shared with us amazing steps in virtual reality and sensors and how we can use these technologies to support wellness, engagement and long life. The roses were presented to Neil McDonald and Ian Peddie for their consistent dedication to the Shred-it Day project and for organizing the volunteers and the trucks. Thank you to the volunteers who showed up to work on Saturday. Thank you to Shred-it for their support for the past 10 years! Dispose of your personal records securely— and support Kiwanis programs, too! Bring your old tax files and other personal records for this one- day fundraising event. Watch as Shred-it technicians securely shred your documents in their mobile shredding trucks. Saturday, October 20 from 9 a.m. to 2 p.m.
Our speaker will be Zainab Muse – CEO and Founder of Wingd who will be speaking on Youth Advocacy, Entrepreneurship and Diversity & Inclusion. Lunch was well attended with 65 members and guests. Thank you to Jamie Johnson for showing the video of the past year’s activities. Immediate Past President Steve Moore offered his thanks to everyone for their support during the past year and incoming President Mark O’Neill was proud to share his plans for the new year starting October 1st. Thank you to the outgoing Board for their personal efforts. The new Board of Directors is noted at the bottom of this newsletter. A new year ahead – it’s a great time to be part of the Kiwanis Club of Ottawa! Come for Europe, stay for dinner! In advance of the turn over luncheon on Thursday September 27, 2018, at the Canadian Museum of History, 100 Laurier St, Gatineau, QC., join us to welcome incoming Kiwanis President Mark O’Neill and to say thank you to departing President Steve Moore. The evening starts at 5:00 with a tour of the new exhibit “Medieval Europe” followed by a three-course dinner at Bistro Boreal and entertainment. It’s heartening to see communities coming together to support the many who are still recovering from #ottstorm. The Kiwanis Club of Ottawa is proud to support the efforts through a $7,660 donation to the Ottawa Food Bank and wishes all affected a swift recovery. A very successful event was held at the Techumseh Golf Course on Monday, September 17th, thanks to the generosity of our corporate member James Maxwell of the Investment Partners Fund Inc., and, Pierre Fortin of Groupe Fortin. A good turnout of participants enjoyed the perfect weather on the golf course, followed by a delicious beef dinner, and the company of good friends - new and old. The final amount is still to be calculated but we are pleased to estimate results of $25,000. Final report to follow soon. 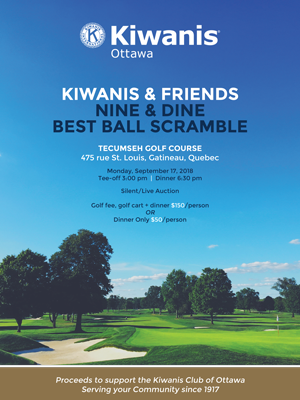 Proceeds of the tournament will help support the projects of the Kiwanis Club of Ottawa. 2018-09-14 12:00 at the Ottawa Hunt and Golf Club. Join us to hear more about Kiwanis Corporate Membership from one of our own members, Mark Bonneau from the Ottawa Senators Hockey Club. Mark will speak about their long-standing relationship with our club as one of our first Corporate members. We will also be introducing a number of new members. 12:00 at the Boat House Restaurant. A round table to share time with fellow members.